While other tablet manufacturers such as HP and RIM are having trouble with just one flagship model, Samsung is continuing to append its lineup of Galaxy Tab tablets. According to DailyTech, Samsung will soon be releasing an overhaul of its original 7-inch Galaxy Tab tablet. 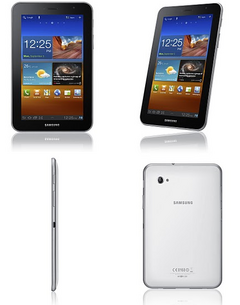 The new redesign, called the Galaxy Tab 7.0 Plus, will be sleeker, faster and lighter than its predecessor. The device will be 9.96mm (0.39 inches) thick, weigh 345g (0.76 pounds) and include a dual-core 1.2GHz Exynos CPU, the source claims. For comparison, the original Galaxy Tab 7 is 11.98mm (0.47 inches) thick, 380g (0.84 pounds) in weight and runs on a single-core 1.0GHz Hummingbird CPU. RAM is also expected to be doubled from 512MB to 1GB with added wireless-n, HSPA+ support and a microSD slot. In terms of software, the “Plus” model will ship with Android 3.2 while the original will be stuck with Gingerbread. With so many Galaxy Tab models out in the market, this image here provides a very concise overview of the sizes currently available. Samsung now has all its bases covered with models ranging from the 4.27-inch Galaxy S II smartphone all the way up to the 10.1-inch Galaxy Tab 10.1. The Galaxy Tab 7.0 Plus is said to be releasing this October in Indonesia and Austria. For other markets, such as Asia, U.S. and Europe, the tablet should be making its way in the coming months.